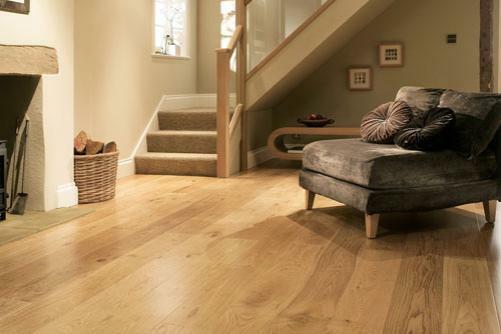 Solid Oak Flooring is constructed from a solid piece of oak and is built to last. A true solid oak flooring is a genuine investment in your home and can last for generations if well maintained. Typically the most expensive flooring in comparison to engineered oak and laminate flooring, but also the most attractive and long-lasting. What Is Solid Oak Flooring? 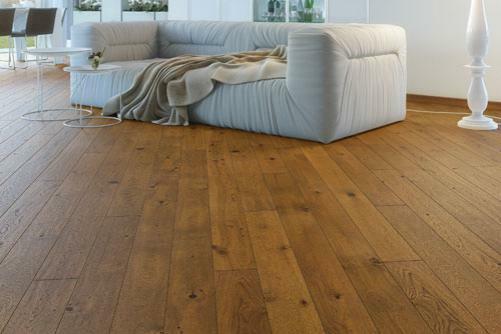 Solid oak flooring is a 100% natural wood product made from just one piece of timber. How it’s cut can differ from product to product, and it’s really up to your own preference and budget. Flat-sawn oak is the most common and sustainable way to process oak, and therefore the most affordable. Rift-sawn oak is the least common and produces the most waste, increasing the price of the lumber. Quartersawn oak straddles the line between these two types. Each method yields a different wood pattern, with rift sawn wood producing the most uniform, and aligned textures. Once sawn, the boards are placed in a kiln for drying. Why Choose Solid Oak Flooring? Solid hardwood floors appeal to those who crave only the genuine article. The flooring is the hardest wearing of them all and can be re-sanded and re-finished many times, which is why it’s such a sound investment. However, it requires regular care and maintenance, and is not suitable for use in (and sometimes above) rooms with high moisture content, as the natural materials may warp. Authenticity – Solid wood floorboards are warm to the touch, and they feel as good as they look. For more specific information or help regarding any of the products we sell, please don’t hesitate to get in touch with a member of our expert sales team on 01691 671020 for further assistance. 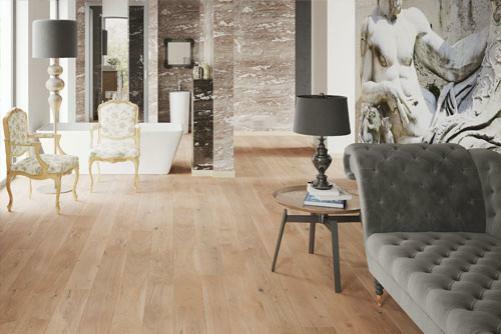 Full-bodied, rich and earthy, our Rustic Brushed Oil Grade Oak flooring is a delight for the senses. This solid oak flooring is both brushed and oiled to enhance the natural beauty and textures of the wood. 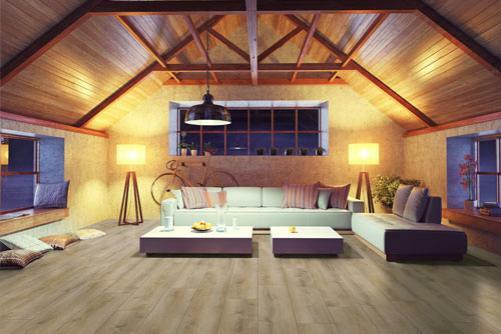 Our premium grade Rustic Brushed UV Lacquered Oak Flooring is built to last. It's a handsome investment in your home that will develop and mature beautifully. Engineered Oak flooring perfectly blends elegance and sophistication with practicality: the result is a premium floorboard which is easy to install, resistant to temperature change, and a richly featured oak surface. Engineered wood flooring is an all wood solid construction floorboard. It’s made with three different layers of wood to create a stable, durable and quality floor solution. Engineered flooring is closer to solid wood flooring than it is to laminate flooring, as it’s constructed out of 100% timber. The top layer, usually around 3mm, is genuine oak which is available in many different styles, to suit your tastes. The surface is abundant with all-natural grains and textures and will age gracefully. The middle and bottom layer are made of a cross structure of hardened coniferous wood and it’s these layers that provide the flooring with its strong core and easy to install 2G/5G system. Out of the three types of flooring we stock – laminate, engineered and solid oak – there is no one clear winner. Each has their own advantages and disadvantages and are suitable for different rooms, budgets and purposes. Perhaps the main reason people choose engineered flooring is that it looks more realistic than laminate but is more affordable than solid oak. The genuine oak surface provides the authentic charm laminate flooring attempts to emulate. On top of this, engineered flooring is much more versatile than solid oak flooring, as it’s resistant to moisture and changes in temperature and less likely to suffer from shrinkage. Price – More affordable than solid oak but with the same natural grains and surface texture as solid hardwood. Ease of installation – Engineered floorboards are very easy to install, particularly if you opt for the 5G click system. This engineered oak flooring, constructed with a genuine top layer of premium oak, is a stunning addition to your living space. The natural grain surface layer has minimal knots and colour variation for a timeless and understated look and is easy to care for. This engineered hardwood floor, with a 3mm natural sandy oak top layer and finished with high-quality matt lacquer, adds style and substance to living rooms, dining areas and bedrooms. There is also a wider board variant of this particular product (either 130mm wide or 180mm wide). The naturally warm, rich caramel tones of this engineered oak flooring create an inviting and relaxed environment in your living spaces. Dark, inviting and sumptuously rich, this engineered oak flooring, brings sophistication to modern and period style homes. 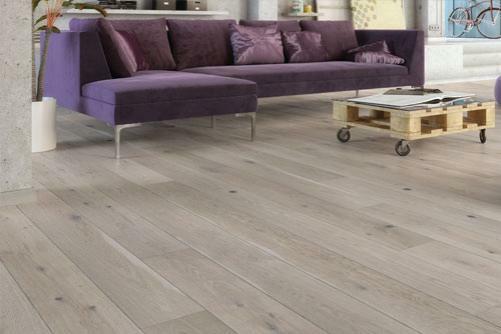 This pale oak engineered wood flooring brings a light and airy feel to a variety of living spaces. 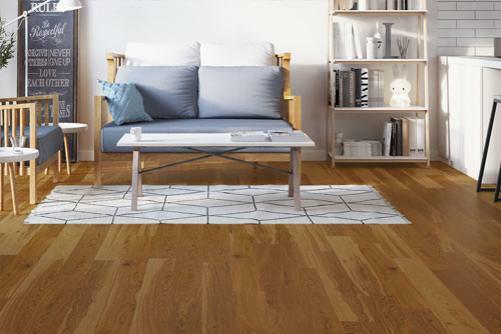 The Sandy Oak 1 Strip Matt Lacquer features subtle and harmonious natural colour variations of real hardwood flooring for a clean and understated look. 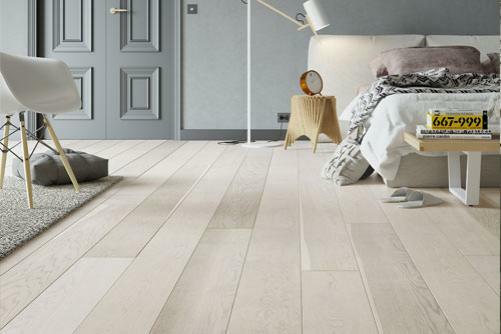 Ideal for the modern home, this pale shade of engineered oak flooring strikes the perfect balance between the rustic charm of oak and contemporary stylings. Laminate flooring is one of the most popular and practical flooring solutions, due to its low price, durability and the contemporary high-quality imaging used to replicate the genuine look and texture of hardwood. It’s also easy to clean, and once installed, little maintenance is needed. While you should ensure that spillages are cleaned quickly and that regular vacuuming removes grit and other materials that may scratch the surface, its hard resin top coat protects the flooring from most everyday wear and tear. This man-made product is constructed by fusing multiple layers together after the lamination process. The four layers are a backer paper, high-density fibreboard (HDF) core, the decorative photo layer and finally the resin overlay. 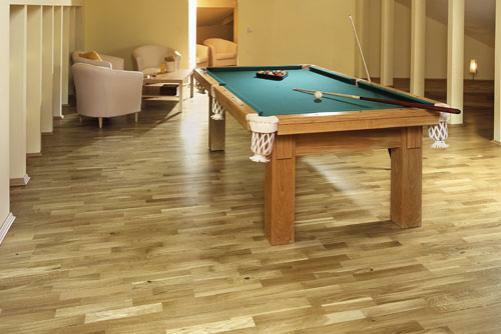 These four layers work in unison to create a durable, photo-realistic and hard-wearing piece of laminate flooring. 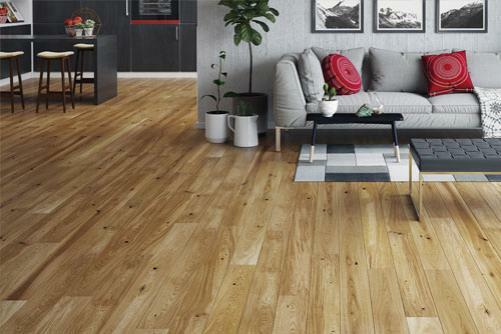 As photography, printing and technology have improved exponentially in recent years, laminate flooring has been able to catch up with its real wood counterparts. The result is a wide variety of highly detailed styles to choose from, that are hard to distinguish from the real deal. 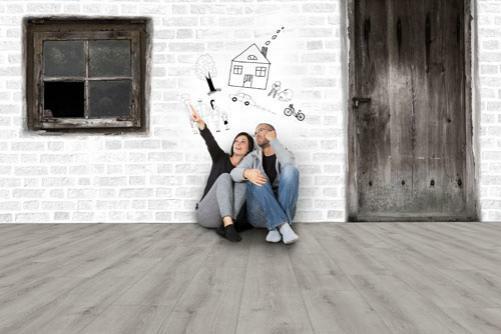 When looking for new flooring it’s best to consider what’s right for your home, budget and lifestyle. Each of our types of flooring – solid oak, engineered and laminate – have their own benefits and disadvantages. Laminate flooring is no different, however, most people choose it due to its affordability, longevity and low maintenance. Price – Laminate flooring’s greatest strength is its value for money and often the price of laminate flooring is unbeatable. The materials are less costly to obtain and manufacture than more traditional solid wood floors, and installation is even better value as the 5G clicking system is simple enough that you can DIY. Durability – Despite the lower cost compared to other types of flooring such as solid oak or engineered oak; laminate flooring is exceptionally durable thanks to the materials used and its manufacturing process. Laminate flooring is moisture and general wear and tear resistant with a good tolerance for scratches. 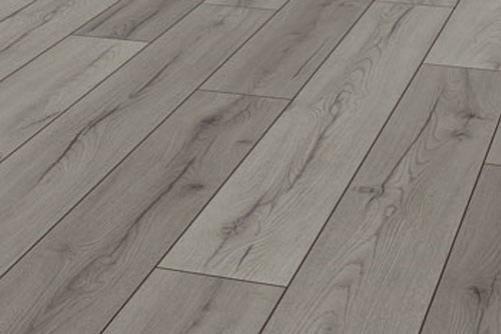 A range of style options – If you prefer a more modern and uniform style, laminate is the go-to choice, as it’s possible to select a style with fewer colour variations. However, those who enjoy the traditional and welcoming feel of hardwood flooring, but are looking for a more affordable solution, the addition of bevelled edges create the illusion of traditional solid oak flooring. Due to advanced digital photography, there is a broad range of options to choose from, the possibilities of laminate flooring are endless. Whether your home has a modern, bohemian or rustic feel, there will be a laminate flooring style to compliment your perfect living space. This well-loved classic laminate in natural oak hues is elegant in its simplicity. 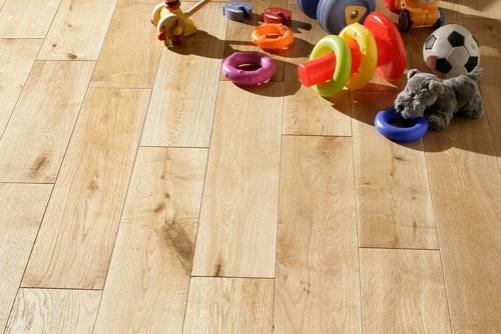 Our Trend Oak Nature laminated flooring is ideal for playrooms and kitchens, or places where regular cleaning occurs. The resin surface can be wiped down or cleaned with a damp mop and vacuuming the smooth all-over surface structure is a breeze. Installation is easy, with angle-angle lock fitting systems, and as there are minimal gaps between the laminate, it's almost impossible for dirt and grime to gather. 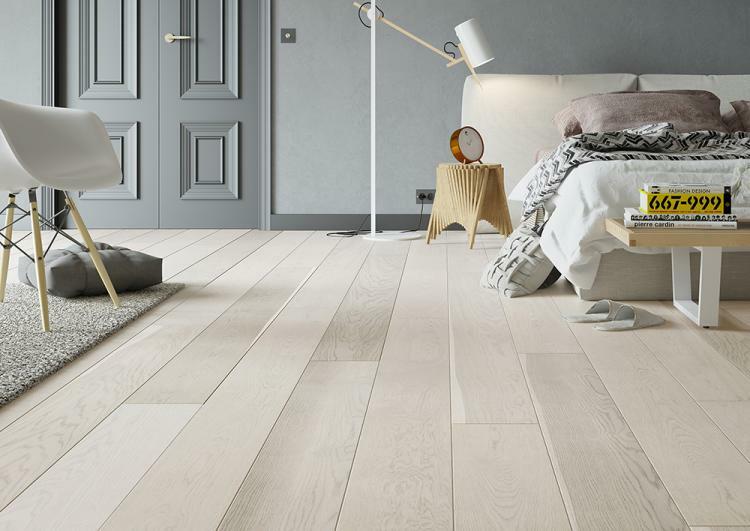 A cool, crisp and contemporary backdrop to the modern home: this 6mm high-density fibrewood laminate flooring is a striking way to refresh bedrooms, living rooms, dining areas and kitchens. Manufactured in Europe, the hard-wearing, all-over surface structure offers subtle oak textures for an easy to clean, minimalist appeal. This classic 7mm laminate mimics the characterful texture of oak with tasteful and subdued golden hues, creating the perfect environment for relaxing with family and friends. It's compatible with water-based underfloor heating, and its high-density fibreboard base makes it a worthy long-term investment for your property. 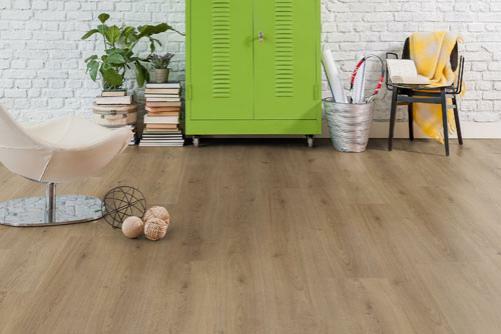 Home enthusiasts and professionals alike will be able to install the Summer Oak Nature laminate flooring problem-free, due to its intuitive 5G click fitting installation system. For a modern and minimalist aesthetic that brings a sense of substance to dining areas, bedrooms and kitchens, this 7mm Century Oak Grey laminate is the perfect upgrade to your home. For those who appreciate a clean style and home, this laminate flooring is a neat solution. The V Groove bevelled edges and high-quality oak effect create the illusion of traditional hardwood flooring, but the resin laminate surface means that cleaning is fuss-free.